Home→Uncategorized→Can You Guess What McDonald’s Food Item This Is? This post was noted in Facebook and I just thought it worth passing on as a web link….This is supposed to be food….and chicken at that! Looks like ice cream and the ingredients are really just …… well read on yourself and make your OWN mind up! You have been served………….with mechanically separated chicken! Over a billion sold! 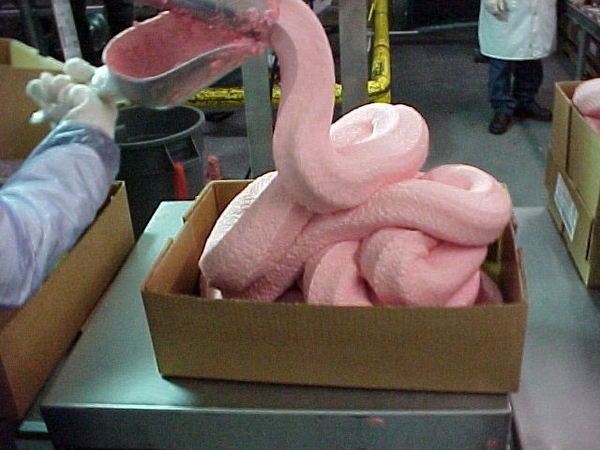 This is what fast-food chicken nuggets, processed frozen chicken meat, and patties are made of. BARF!!!!! Here’s the creation process. What they do is take parts of a chicken and put it through this machine that mechanically separate the meat from the bone. Unfortunately, that doesn’t happen. What it does instead is smash EVERYTHING including the bones, eyes and guts making it come out looking like the picture above. Dude? That’s what dye is for. So in order to get people to devour this crap, they dye it with artificial colors in order to give it that white texture……more here….